Amlodipine is an antihypertensive drug that is used in treatment of high blood pressure and chest pain. Amlodipine: Structure and chemical information. Initially, Pfizer Pharmaceuticals was responsible for its manufacture and distribution. Many other pharmaceutical companies such as Teva pharmaceuticals, Synthon pharmaceuticals, Upsher smith laboratories and Matrix Laboratories also started manufacturing of Amlodipine under various brand names after the expiration of Pfizer’s patent in 2007. Amlodipine plays a key role in the treatment of high blood pressure (hypertension). It is used for the treatment of chronic stable angina and vasospastic angina (prinzmetal’s or variant angina). However, it does not provide immediate relief of pain resulting from angina. 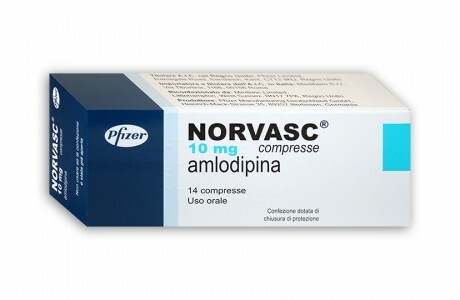 Amlodipine is also used in the treatment of coronary artery disease. Amlodipine in combination with Angiotensin Converting Enzyme (ACE) inhibitors such as Benazepril is used to treat the hypertension. Combination of Amlodipine with Angiotensin II type 1 receptor blockers (ARBs) such as Valsartan (Exforge) and Telmisartan (Twynsta) also significantly decreases the possibility of cardiovascular-related death and morbidity in hypertensive patients. Amlodipine lowers the blood pressure and hence it helps to prevent heart attacks, strokes and kidney problems. Furthermore, it also boosts the capability to exercise and reduce the incidence of angina attacks. Amlodipine is 1, 4-dihydropyridine and mainly available as besylate salt. It is also available as maleate salt. It is a synthetic pharmaceutical aromatic heteromonocyclic compound with a molecular formula C20H25ClN2O5. 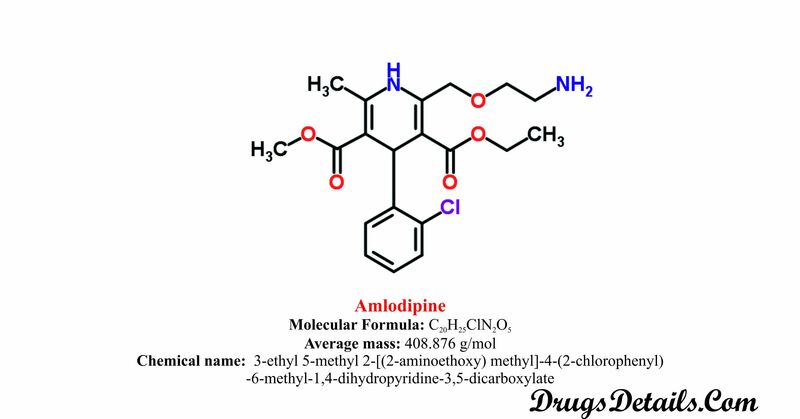 The molecular weight of the Amlodipine is 876 g/mol. Chemically, Amlodipine is 3-ethyl 5-methyl 2-[(2-aminoethoxy) methyl]-4-(2-chlorophenyl)-6-methyl-1,4-dihydropyridine-3,5-dicarboxylate. Amlodipine is white and crystalline powder and has water solubility of 0074 mg/mL. Amlodipine is sparingly soluble in ethanol while slightly soluble in water. What is the available strength of Amlodipine? Amlodipine is available in tablet form for oral administration with or without food. Amlodipine tablets are available in different strength of 2.5 mg, 5mg and 10 mg/tablet. 5 mg tablets are white in color, diamond shaped, flat-faced and bevelled edge engraved with “NORVASC” on one side and “2.5” on another side. 5 mg tablets are white in color, elongated octagonal in shape, scored, flat-faced and bevelled edged engraved with “NORVASC” and “5” on one side while plain on another side. 10 mg tablets are white in color, round in shape, flat-faced and bevelled edged engraved with “NORVASC” and “10” on one side while plain on another side. Amlodipine tablets contain Amlodipine besylate as active ingredient and magnesium stearate, microcrystalline cellulose, calcium hydrogen phosphate anhydrous and sodium starch glycolate type-A as inactive ingredients. How Amlodipine works (mode of action)? Amlodipine is a slow but long-acting calcium channel blocker or calcium antagonist. It acts by inhibiting the calcium ion influx through L-type calcium channel across the cell membrane. After entering in the cell, calcium ions binds to calmodulin and form calcium bound calmodulin complex. This calcium-calmodulin complex activates the myosin light chain kinase (MLCK) which catalyses a key step in muscle contraction that is the phosphorylation of regulatory light chain subunit of myosin. Inhibition of calcium ion influx results in the decreased contractile activity of arterial smooth muscle cells. This reduction in contractile activity of arteries can cause the vasodilation. Effect of vasodilation finally results in lowering the blood pressure. It is also supposed that Amlodipine inhibits the activity of carbonic anhydrase I in vascular smooth muscle. Therefore, it causes the increase in pH which may be involved in the regulation of intracellular influx of calcium. What are the recommended doses of Amlodipine? The prescribed dose of Amlodipine is 5 mg once a day initially and then 10 mg once a day. However, the doses of Amlodipine may vary depending upon the age and diseased state of the patient. < 6 years: not recommended. 6 years to 17 years: 2.5 mg to 5 mg once in a day orally. Initial dose: 5 to 10 mg once everyday orally. Maintenance dose: 10 mg once everyday orally. Initial dose: 5 mg once everyday orally. Maintenance dose: 5 to 10 mg once everyday orally. Initial dose: 2.5 mg to 10 mg once everyday orally. Initial dose: 2.5 mg once everyday orally for 7-14 days. Maintenance dose: 2.5 to 10 mg once everyday orally. Initial dose is 2.5 mg and then gradually increase the dosedepending upon the efficacy and side effects. 5 mg to 10 mg once a day orally. Dose in renal impairment: no dose adjustment is required. When should I discontinue, withhold or modify the dose of Amlodipine? Do not use the medicine if you are hypersensitive or allergic to any of the ingredients of Amlodipine. Amlodipine is not used in patients of hypotension (low blood pressure). The drug is also withheld in case of aortic stenosis (narrowing of the left ventricle exit of the heart) and liver disease. Use of Amlodipine is contraindicated with other calcium channel blockers and vasodilator agents. Amlodipine together with CYP3A4 inhibitors such as ketoconazole and clarithromycin is contraindicated because these compounds may increase the plasma concentration of Amlodipine. Use of antihypertensive drugs with Amlodipine is also contraindicated because it may decrease the serum concentration of Amlodipine. Amlodipine is also contraindicated with the antifungal agents such as itraconazole and voriconazole because they may enhance the toxic effects of the drug. Amlodipine together with macrolide antibiotics such as sulfisoxazole is also contraindicated because these compounds may decrease the metabolism of the calcium channel blocking agents. Amlodipine is not recommended for the children under the age of 6 years. Amlodipine is used with caution in elderly people due to the reduced clearance of Amlodipine from plasma. Pharmacokinetic studies suggested that after oral administration, it is almost completely but slowly absorbed in gastrointestinal tract and has a bio-availability of approximately 64-90%. Following absorption, the majority (97.5%) of the drug is bound to plasma proteins. It has been observed that following a single dose of maximum (or peak) plasma concentration is achieved in 6-12 hours in the fasted state. The drug is largely (90%) metabolized in liver by cytochrome P450 3A4 (CYP3A4) to inactive pyridine metabolites. Amlodipine is mainly excreted in urine in which 10% of the parent compound and 60% of the inactive metabolites are present. The average steady state volume of distribution of the Amlodipine is approximately 21 L/kg. Which pregnancy category (A; B; C; D; X) has been assigned to Amlodipine? Due to lack of adequate and well-controlled studies, the use of Amlodipine in pregnant women is contraindicated and recommended only when benefit justifies the risk. Laboratory studies in animals have shown no adverse effect on fetus. No data is available that supports the excretion of Amlodipine into human breast milk. Despite these facts caution should be exercised when taking Amlodipine during breast feeding. Amlodipine is available in tablet form for oral administration. Amlodipine tablet is taken by mouth before or after food and drinks. Amlodipine tablets should not be chewed or crushed. Whole tablet should be swallowed. It is also recommended to take drug at almost the same time every day with a glass of water. It is advisable not to take more than one tablet daily. The time duration between the drug use should be at least 24 hours. Follow the instructions carefully as directed on prescription leaflet and take Amlodipine exactly as directed. Amlodipine is stored at 25°C (77°F) and excursion permitted to 15-30°C (59-86°F). Amlodipine should not be disposed in the household garbage, sink or in wastewater. Does Amlodipine has approval from government / FDA /or any other related agencies? Amlodipine in the form of besylate salt was first approved in July, 1992 by U.S. Food and Drug Administration for the treatment of hypertension and coronary artery diseases. New formulation of Amlodipine i.e. Amlodipine maleate salt was approved in October, 2003 by U.S. FDA. Amlodipine may be used in combination with beta-blocker to treat the chronic stable angina. Amlodipine may also be used for other uses not listed here. It is advisable to ask your doctor or pharmacist for more information. Take low-salt diet or as prescribed by your doctor otherwise follow usual diet. Consult your doctor regarding the use of grapefruit products. What special precautions should I follow/ what should I avoid while using Amlodipine? Before taking Amlodipine, tell your doctor about your medical history preferentially if you have any kind of liver disease. Take advice to your medical health provider if you have any other kind of heart problem or ever had heart failure. Grapefruit or grapefruit juice should be avoided because it may increase the level of active Amlodipine in the blood which may cause toxicity. Avoid the use of alcohol because it may further decrease the blood pressure. Amlodipine should not be used in conjunction with multivitamins and minerals because it may decrease the effect. Amlodipine medication should not be stopped suddenly and avoid to skip the dose. Avoid using machinery requiring alertness or clear vision as well as driving because the use of Amlodipine may make you tired or dizzy. In addition to the associated benefits, Amlodipine also is accompanied with the side effects some of which are more common, others less common whereas some are more serious. It is always recommended to consult a doctor if you encounter any of the side effects. Cardiovascular effects: palpitation, bradycardia, tachycardia, chest pain, hypotension and vasculitis. Dermatologic effects: angioedema, increased sweating, erythema multiforme, erythematic rashes, pruritus, maculopapular rash, dermatitis, skin decolouration and dryness, urticaria and alopecia. Gastrointestinal effects: nausea, dysphagia, abdominal pain, anorexia, diarrhoea, dry mouth, constipation, vomiting and gingival hyperplasia. Haematological effects: leukopenia, thrombocytopenia and purpura. Hepatic effect: jaundice and elevated hepatic enzyme. Musculoskeletal effects: myalgia, arthralgia, muscle cramps, arthrosis, hypertonia, twitching and weakness. Nervous system effects: headache, dizziness, somnolence, hypoesthesia, paresthesia, syncope, postural dizziness, tremor, vertigo and tinnitus. Ocular effects: conjunctivitis, abnormal vision, eye pain, diplopia. Psychiatric effects: anxiety, depression, abnormal dreams, depersonalization, nervousness, insomnia, amnesia and agitation. Respiratory effects: epistaxis, dyspnea, rhinitis and coughoing. Urinogenital effects: menstrual disorders, nocturia, polyuria and dysuria. Symptoms of Amlodipine overdose may include increased heartbeats, fainting and dizziness. Amlodipine may interact with one of the following drugs. Care should be taken when you are taking these medications together. Antacids which contains aluminium or magnesium such as Maalox. Antibacterial agents such as rifampin (Rifamate, Rifadin and Rimactane), rifabuttin (Mycobutin), nelfinavir (Viracept), nevirapine(Viramune), clarithromycin (Biaxin) and fluconazole (Monicure, Canesten, Alfumet or Dofil). Antidepressant drugs such as nefazodone (Nefadar, Serzone and Dutonin). Antiepileptic medication such as phenytoin (Dilantin,Dilantin) and carbamazepine (Carbatrol, Equetro, Epitol, Tegretol, Teril). Antifungal agents such as fluconazole (Diflucan) and voriconazole (Vfend). Antihistamines such as cimetidine (Tagamet) and terfenadine (Seldane). Antihypertensive agents such as alfuzosin (Uroxatral), amifostin (Ethyol) and bosentan (Tracleer). Drugs for the treatment of HIV/AIDS such as indinavir (Crixivan) and efavirenz (Sustiva, Efavir, Stocrin). Drugs for treating pulmonary hypertension such as sildenafil (Viagra) and Tadalafil (Cialis). Immunosuppressant drugs such as cyclosporins (Neoral and Sandimmune), tacrolimus (Prograf and Astragraf) and phenobarbitol. Inhibitors of CYP3A4 such as ketoconazole (Nizoral, Kuric, Extina and Xolegel), itraconazole (Sporanox, Onmel) and ritonavir (Norvir). Inhibitors of CYP450 such as diltiazem (Tiazac, Cardizem), quinidine, digoxin (Lanoxin) and warfarin (Coumadin and Jantoven). Inhibitors of HMG-CoA reductase enzyme such as atorvastatin, lovastatin and simvastatin (Zocor). This list of drugs interacting with Amlodipine is not complete and other drugs may also interact with it. Always consult your doctor about the medications you use. Does Amlodipine have any interaction with diseases? Cardiogenic shock/Hypotension: Use of calcium channel blockers (CCBs) including Amlodipine is usually not recommended in patients with hypotension or cardiogenic shock. This is due to associated negative inotropic and peripheral vasodilating effects resulting in further reduction in cardiac output and blood pressure that may be life threatening in these patients. Coronary artery disease: Administration of Amlodipine should be done very cautiously in patients with significant coronary artery disease and those treated with immediate-release formulations. Use of the drug may be associated with increase in frequency, duration, and/or severity of angina, as well as acute myocardial infarction. Liver disease: Amlodipine, a calcium channel blocker is mainly metabolized by the liver. Patients with severe hepatic impairment tend to accumulate substantial amount of drug due to prolonged half-life of the drug. Besides, use of the drug may also be associated with increase in serum transaminases which may or may not cause concomitant rise in alkaline phosphatase and bilirubin thereby leading to cholestasis or hepatocellular injury in some cases. It is therefore recommended to adjust the dosage of the drug and use it with caution in patients with impaired hepatic function. Also, a periodic monitoring of liver function is required. Congestive heart failure, Myocardial infarction: Administration of calcium channel blockers (CCBs) including Amlodipine may result in congestive heart failure (CHF), worsening of CHF, pulmonary edema, and peripheral edema. CCBs therapy should be initiated very cautiously in patients with severe left ventricular dysfunction, cardiac failure, acute myocardial infarction and pulmonary congestion. Geriatric state: Dosage adjustment is usually needed in case of elderly patient due to decreased renal, hepatic, or cardiac function and keeping in mind about the concomitant diseased state or other drug treatment. The drug should be started at a lower dose as the elderly people have decreased clearance of Amlodipine which tends to accumulate. Hypersensitivity: Amlodipine administration is usually not recommended in people who are hypersensitive or show allergic reaction to the drug or any of its ingredients. Your pharmacist or health care provider can provide more information about Amlodipine. Double-blind, placebo-controlled and randomized studies demonstrate the antihypertensive efficiency of Amlodipine on diastolic pressure to be similar in young and geriatric patients whereas effect on systolic pressure was greater in older patients. The efficiency of Amlodipine at a dosage of 5–10 mg/day in angina patients has been demonstrated over long-term dosing of upto 6 weeks with no clinically significant reductions in blood pressures or heart rate. Double-blind, placebo-controlled clinical trial indicates the effectiveness of Amlodipine therapy in decreasing attacks by approximately 4 per week in contrast to approximately 1per week in placebo. Studies indicate the efficacy of Amlodipine as once daily antihypertensive agent within safety limits and requirement of higher doses of Amlodipine in younger patients. Clinical studies suggest that Amlodipine does not play a role in prevention of the cold-induced physiological responses of blood pressure or heart rate. Study demonstrates the antihypertensive properties of Amlodipine once-daily in the treatment of hypertension in young population. Amlodipine is also involved in the management of diseased state in patients who are coadministered with cyclosporine. Randomized Amlodipine survival evaluation study in patients with severe heart failure indicates a decreased mortality in the group of patients receiving Amlodipine.